The all-new Tableau Bridge enables a true hybrid data environment in your organization. 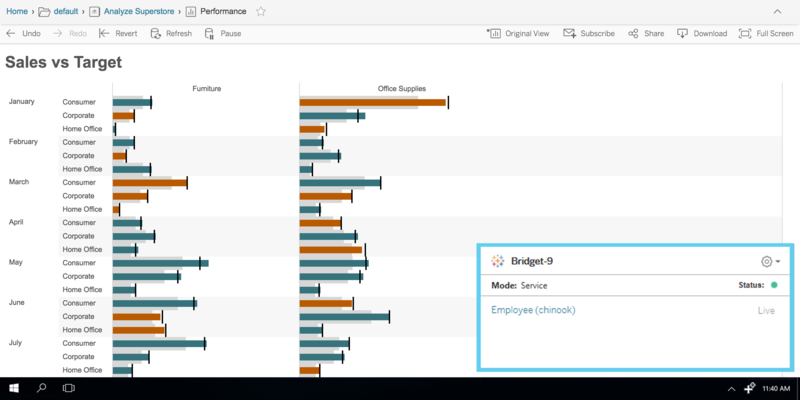 New in Tableau 10.3, the Tableau Bridge upgrades everything you know and love of the Tableau Online Sync Client, and adds new live query capabilities. The Tableau Bridge is in limited release for 10.3. If you’re a Tableau Online site administrator, keep an eye out for an email invitation after the launch of Tableau 10.3. We’ll flip the switch for your site’s Tableau Bridge after we receive your signup. What can the Tableau Bridge do for me? Imagine for a moment that your marketing team’s data is streamed from the cloud, while your inventory data is stored in an on-premises database. Your sales team needs comprehensive, up-to-date KPI generated from both these data sources for use in customer on-sites. With the Tableau Bridge, you can now publish dashboards to Tableau Online and maintain a live connection to any data source behind a firewall. As a desktop service, the Tableau Bridge runs in the background on a computer in the same network as your data. 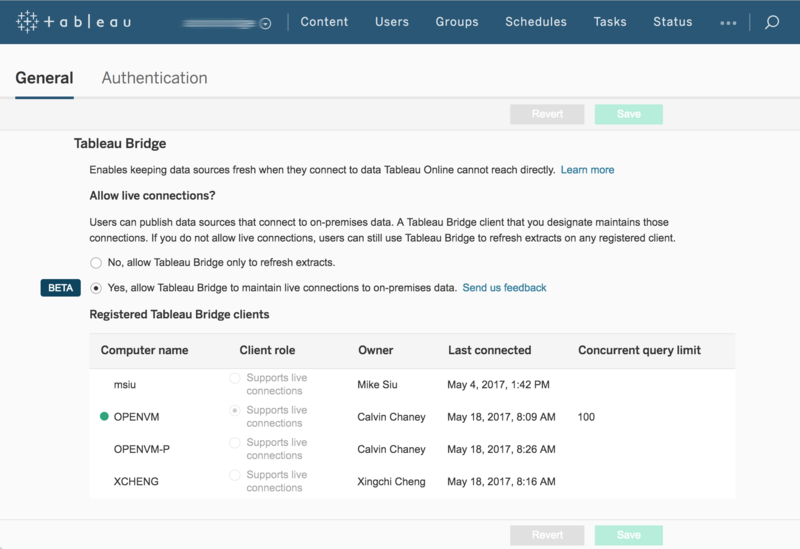 The Tableau Bridge communicates with Tableau Online from behind your firewall, handling both scheduled extract refreshes or live queries of your published data sources. As requests arrive, the Tableau Bridge queries your local data and securely sends the results back to Tableau Online. Furthermore, because the Tableau Bridge runs as a service on Windows machines, live queries or extract refreshes are available any time your host computer is up and running—even if the user is logged out. 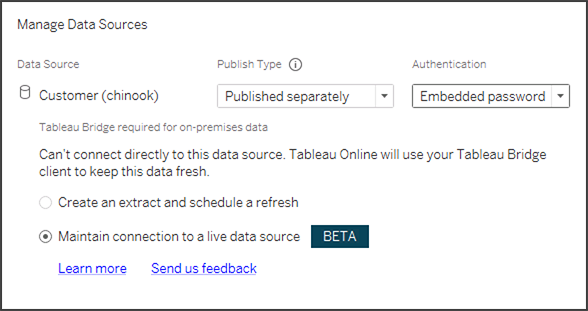 After requesting beta access to the Tableau Bridge, your site administrator can enable live queries for Tableau Online in your site settings. After that, publishers will be able to maintain a live connection to on-premises data sources when publishing vizzes from Tableau Desktop. When users load the viz in Tableau Online, live queries will flow back to your on-premises data via the Tableau Bridge. Even without beta access, the Tableau Bridge also makes sure your on-prem extracts are kept up to date, just as they have been with the Tableau Online Sync Client. The Tableau Bridge also centralizes the administration of queries to on-premises data. With 10.3, Tableau Online site administrators are now the only users with permission to enable live queries. This centralized approach helps your organization govern connections to data residing behind a corporate firewall, and enables administrators to easily limit the number of concurrent queries in order to manage computing resources and ensure the Tableau Bridge’s availability. The Tableau Bridge also allows you to run scheduled extract refreshes for your vizzes on Tableau Online. At the scheduled time of your choosing, the Tableau Bridge creates an incremental or full extract and publishes it to Tableau Online. As with Tableau 10.2 and earlier, publishers can automatically refresh their own vizzes from the Tableau Bridge client running on their personal machine. In practice, we find most sites run a single client for all scheduled extract refreshes—but we believe it should be your choice, and we designed the Tableau Bridge to support both use cases. One Bridge to rule live queries, and another for extracts. If you currently use a dedicated machine to run your extract refreshes, consider setting up another for live queries. It’s possible for both capabilities to be handled by an individual computer (especially if extracts are handled at “off hours” for your regular business), but if you anticipate bursts of live queries while extracts could be running, it is best to separate those loads. Switch the Tableau Bridge to "always on." Unlike scheduled extracts, live queries can happen at any time. Because of this, it’s best to run the Tableau Bridge in "run continuously" mode. More importantly, put the Tableau Bridge on a computer that will almost always be powered on. At Tableau, we run our Bridge clients on virtual machines maintained by our IT department. Tune dashboards and queries for live or extract cases. Dashboards aggregating a vast amount of data are best suited for extracts—Tableau’s fast Data Engine is extremely efficient at querying extracts, and is often faster than live-querying your database. That said, consider which parts of your dashboards would benefit from compact, up-to-the minute data, and which parts rely on summaries of many records. Then design your dashboard to combine extract-based views and live-query views for the best of both worlds. The Tableau Bridge keeps you connected to your data the way you want, no matter where your data resides. Check out the Tableau 10.3 beta to learn more. And all you site admins out there, remember: When 10.3 launches, you’ll receive an email inviting you to request the Tableau Bridge for your organization’s Tableau Online site. I am planning on setting up a Tableau online account to host my company's analytics, and would like to be able link the cloud interface to the company's Access (32bit I think) database. Is Tableau Bridge able to suppport this connection? If not are there any plans to introduce this in the near future?